Humans are great storytellers. We tell each other stories and we tell ourselves stories. We evolved because we used language to help us understand the world around us. We think in terms of narrative and we constantly seek out patterns or themes to help our understanding. This ability is what has elevated us but it also confuses and confounds us. 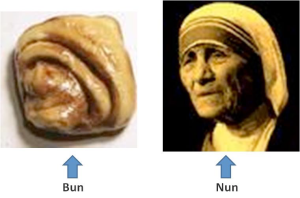 Our search for patterns leads us to make silly mistakes, like the time when a cinnamon roll baked at the Bongo Java Coffee Shop in Nashville became revered for its resemblance to the late Mother Teresa of Calcutta (the so-called ‘Nun on the Bun’). Our mind never stops telling us stories and this includes commentary on our careers. All day, every day the mind commentates – and it’s often pretty negative stuff (remember, the mind’s primary concern is to stay alive so it wants you to learn your lessons). So we hear about what we should or should not be doing, about how we’ll inevitably fail or how no one else rates us. Now, some of these thoughts may be useful and may protect us. 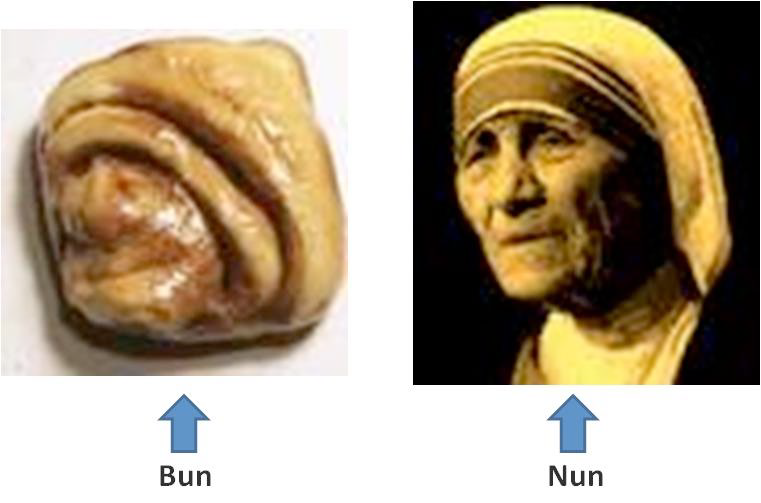 But if we believed every one of these stories then, like the Nun on the Bun, we’d be making some serious mistakes. We’d either do absolutely nothing new or we’d become depressed. Probably both. Many people say things like ‘useless’ or ‘hopeless’ here automatically. Like we say ‘lamb’ in the first example, we tell ourselves a story that we could never succeed in changing career. By cognitively fusing with our thoughts we make patterns and assumptions that become our routine way of thinking. In turn, this often prevent ourselves from doing the things that will make us more fulfilled. Thoughts are wise – we assume they know best and we follow their orders. But the truth is that our minds are not objective storytellers, and the language we use is not objective or accurate either. Thoughts are just that – thoughts. Most cognitive behavioural approaches to negative thinking seek to eliminate negative thoughts and replace them with positive. Indeed, in handbook 2 we made a big effort to think about your achievements. This was to try to rebalance our natural negative bias. However, some negative thoughts simply will not go away. Indeed, the more you push them away the more they return. Trying not to think about failure is not a good strategy for not thinking about failure. Try not listening to a radio to see what we mean! Instead, we prefer to practice cognitive defusion. The aim of this exercise is to try to catch your mind at work telling you stories that are not objective or helpful. We should look at our thoughts, rather than through our thoughts. In other words, treat them as a third party, like passengers on a bus, chattering away in the background. Some thoughts may be helpful (‘stop! There’s someone under the wheels!’), but most have no real consequence to the direction of the bus (‘you really should have turned left there!’). Pick a thought that your mind often tells you in relation to your career change. ‘I am X’ (for example ‘I’m incompetent’ or ‘I’m not good enough’). Is this thought helpful? Does it motivate you? For example, ‘I’m having the thought that I’m incompetent’. Say this to yourself now. You can use this process with any unpleasant thought. This process is known as defusion. In a state of fusion, thoughts seem like the absolute truth; in a state of defusion they are merely bits of language. Information from a third party – simply say thanks, mind! Demons in the rucksack – thank the demon and keep walking in the direction you want. The objective of these metaphors is not designed to make you feel better (though if it does, great). The aim is to identify strategies and patterns of behaviour which are not useful to you and to gently re-focus your attention on things that will be useful to you.